SLC Agrícola has 11 cotton gins for processing and storaging cotton and cotton seed, always seeking safety, product quality and process efficiency. 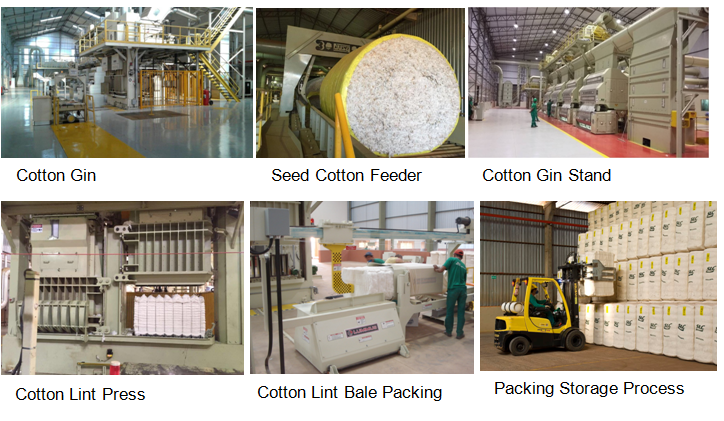 SLC Agrícola’s cotton gins have a production capacity of 5,900 bales/day, an internal space for storing 170,540 cotton lint bales and storage of 26,800 tons of cotton seed. The raw cotton bales produced by SLC Agrícola weigh on average 200-230 kg and go through a strict unified classification process carried out at the take-up room (classification room) and laboratories, where they are classified according to their visual characteristics and using an HVI (High Volume Instrument) system, thus establishing a uniform standard for the entire production. SLC Agrícola has 18 modern grain receiving units, providing an infrastructure capable of receiving, separating and storing soy, corn, wheat, sorghum, sunflower, and other grains. The grains produced are stored in locations where the temperature and aeration is controlled. SLC Agrícola has the receiving capacity of 2,200 tons/hour and a capacity for storing 613,700 tons of products.